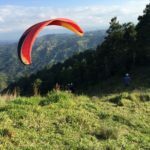 My mother and I had already taken the white-water rafting trip with Flying Tony’s company in the morning, but when our guide invited us for another adventure, paragliding Jarabacoa’s mountains, I said, “No way. Can’t do it! That made me pause. Checo had already kept us safe on 13 km of white-water rapids in the Rio Yaque del Norte. He was strong and savvy. He knew that river. 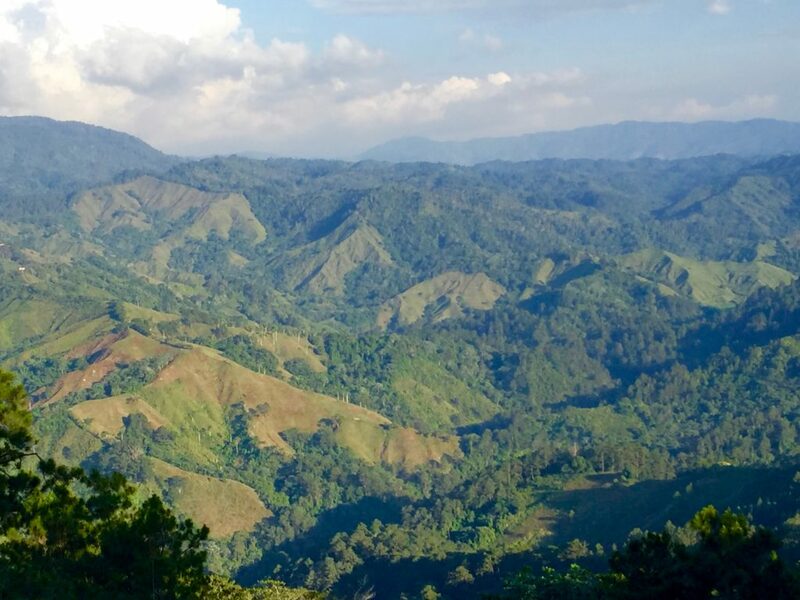 I wanted to believe him—that he also knew the thermals of the mountains above Jarabacoa. 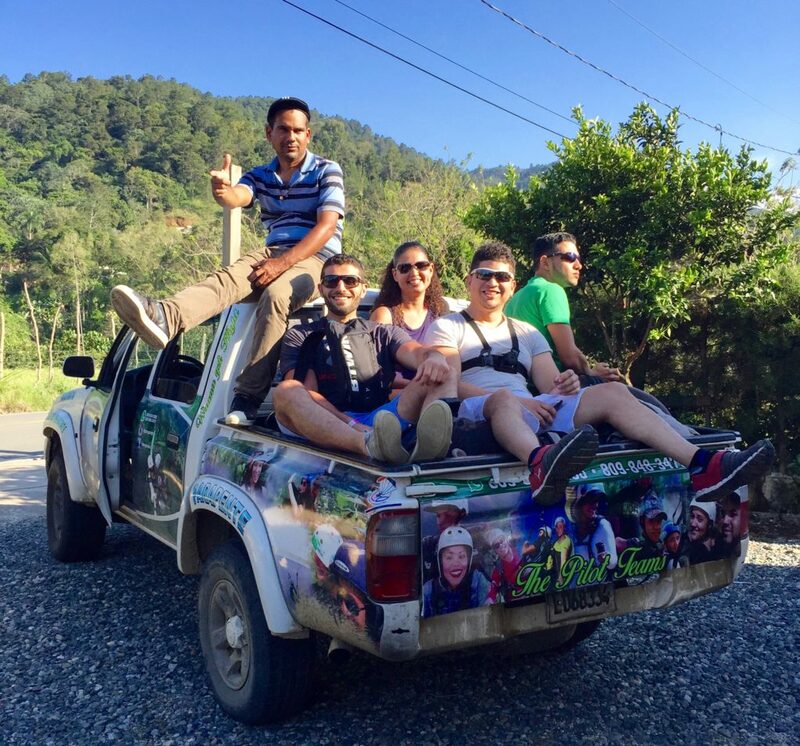 JM Bryce: I’m always interested in discovering adventures for this blog that senior travellers would be able to do. You mentioned that you are travelling with your mother who is 65. How did she feel about paragliding? Mary: She is definitely the adventurous type and did very well with the white-water rafting this morning. But it was fairly tiring. 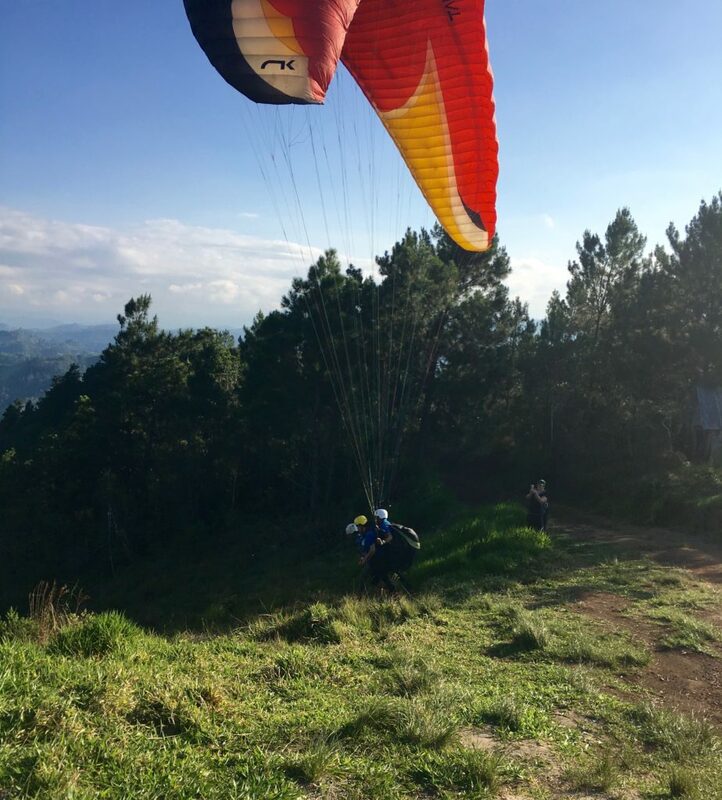 Neither of us had done paragliding before, so we didn’t know what to expect. I really wasn’t sure I could do it, even though I’ve always been strong. JM Bryce: What convinced you to try it? Mary: Basically it all came down to my trust in the guide, Checo. This morning on the river while we were helping the crew put away the boats, Checo said, “Do you want to fly with me?” I brushed it off. But he kept encouraging me to come along with the paragliding group in the afternoon. He kept reassuring me that I could do it. JM Bryce: Did he encourage your mother to go? Mary: She flat out said she’d had enough for one day. I kind of think she’d have done it if she’d come to it fresh and well-rested. But neither one of us understood whether it was a high-impact adventure or not. Frankly, I was scared about landing. And I think my mom was, too. If I hadn’t been able to go with someone I already trusted, like Checo, I don’t think I could have done it. Checo picked us up at Hotel Gran Jimenoa about 4:30 in the afternoon. 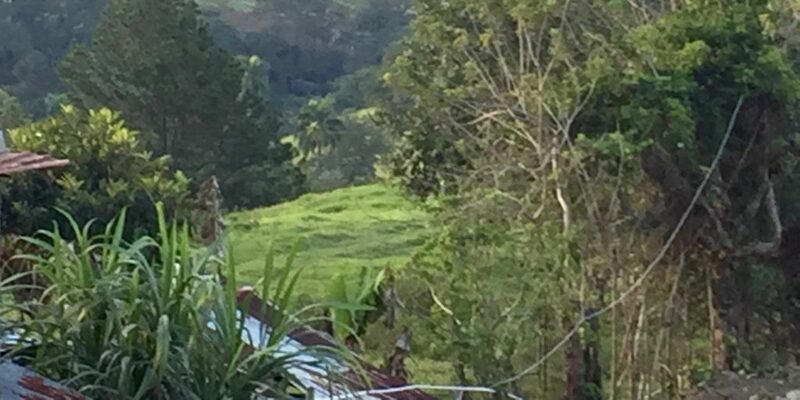 We drove through the town to a private home where they kept the paragliding gear. 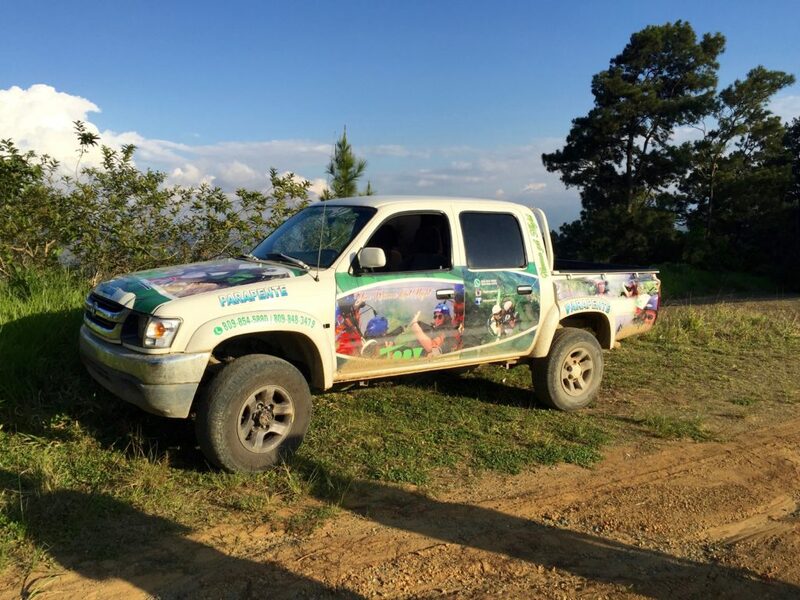 Four other clients, along with one guide per person, clambered into the back of the Flying Tony 4-wheel drive truck amongst bags of gear. With Checo driving, we set out for the mountain. The road was paved and fairly level as we passed through towns. I thought it was interesting to see how Checo used his horn to alert other drivers that we were there and to help part the traffic to let us get through quickly. In Hawaii and other places I’ve lived, honking the horn is rude. Not here in the DR. It’s considered part of the skill of driving. That didn’t exactly calm my nerves! The road became steeper as we drove up a wooded mountain, sometimes with drop-offs on both sides. I felt more and more alarmed. All of a sudden there was this loud roar just behind us. A guy on a motorbike passed us doing a pop-a-wheelie on his back tire, a steep drop-off only inches away, and vanished around the curve ahead of us. I guess he was performing for the crew in the back of the truck. But talk about a death wish! His little glory-stunt destroyed about every bit of calm I’d been working on. And then we turned off onto an even more vertical side-road, unpaved and very rutted. The higher we went, the more unsure I felt. Did I really have the nerve to do it? Finally, the bouncing stopped. The ground was flat. We had arrived at the small flat top of a mountain. 360 degrees of horizon all around us. 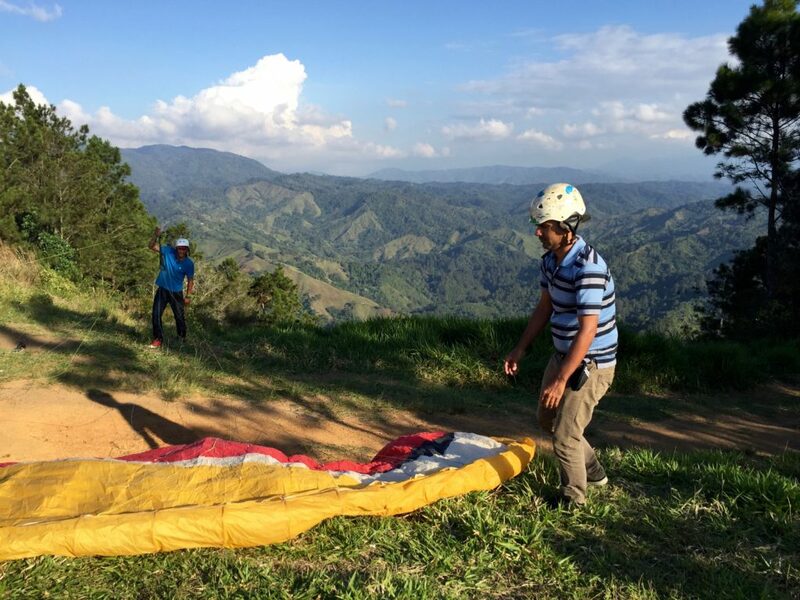 Checo and the other guides had all five gliders laid out and the cords straightened in less than ten minutes. He pointed to a bird soaring just past the launch area and said, “That’s going to be us.” Still not too comforting! I expected a bit of a wait. 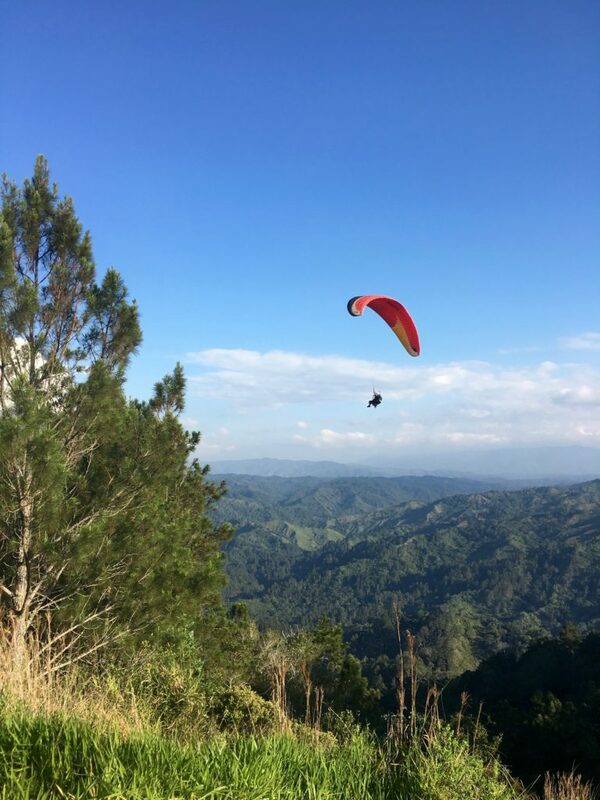 But Checo looked back, saw the kite fluttering in the wind, and immediately said, “Walk, walk, walk!” Then, “Run!” I did what he told me, and a few seconds later we were in the air. He flipped down a little seat for me, and I could feel him close behind, his legs on the outside of mine. That was important to me because it was the only comforting part about hanging from a kite in the middle of a vast sky. When I’d calmed down, he showed me where to put my hands on the handles and I could see his hands behind me. I could feel him on my back all the time, which was very reassuring. I could feel a gust of wind come, and how we’d hang on it. Then he’d pick up another and hang there. I felt large and small at the same time. Small, because of the vast landscape, the expanse of Earth. Big, because everything on Earth was small below me. I thought about God and creation, and I teared up. It was all so beautiful and overwhelming. Checo would talk to me, orient me to where the ocean was, where certain landmarks were. It seemed to me that we stayed out the longest of all the paragliders because we went first. The others needed to wait for each other, the fickle wind, and a helicopter that needed to pass. Then, one by one they caught a thermal that would carry them away from the launch area. Then he added, “But if you have to vomit, do it off to the side!” I didn’t blame him! That would be a bad part of his job. So, I did what he told me and the nausea went away. Checo said, “When we’re about to land, put your feet up.” He kept chatting, which was easy on me and kept me relaxed. Landing was no jolt. He lowered us so gently that I sat right down on my bum—in the middle of a cow pasture. Yes, the cows were moderately interested and stared. We packed up the gear in five minutes or less, and then the next person came in for a landing. The pack he was carrying weighed 70 pounds because of the emergency parachute (which had helped my courage level), but he had it on his back and ran up the road ahead of all of us. There were eight of us in the group, all laughing and good-natured. Nobody seemed to care if he hit a little cow poop. We walked to the edge of the pasture, ducked under the barbed wire fence, and came out onto the road. The truck we’d driven up in was now down from the mountain carrying my mother and her friends, so I climbed in with them. Everyone else, plus the gear, piled into the back. 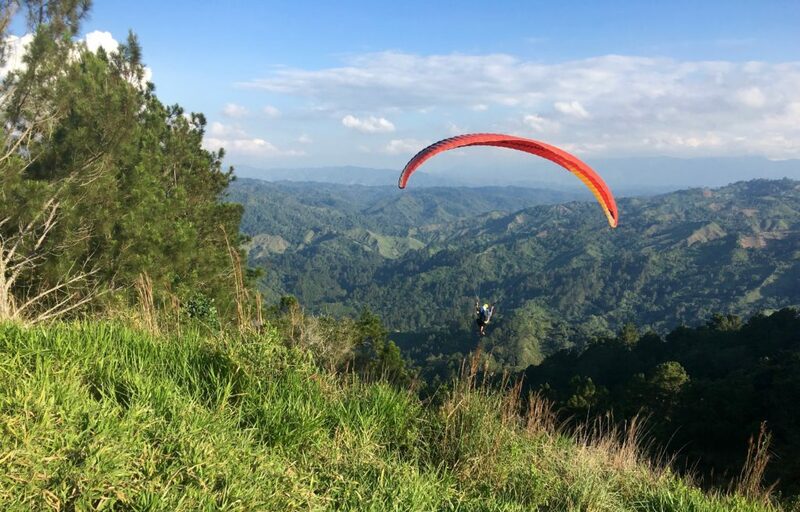 JM Bryce: So now that you’ve had your first experience with paragliding, do you think it’s a sport your mother could have handled? Mary: That’s a very individual decision. She has arthritis and some stiffening in her neck and other joints. But Checo set us down so gently that I didn’t feel any kind of jolt. 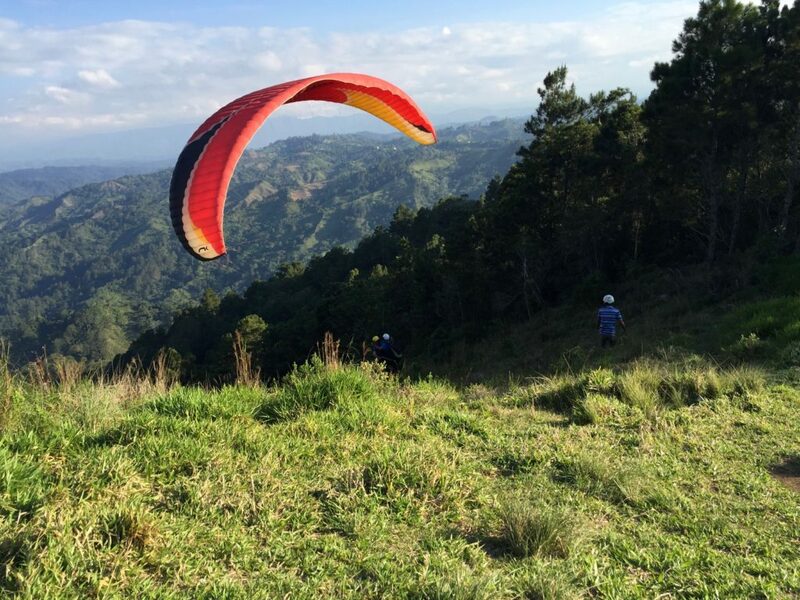 If we’d had another day to spend in Jarabacoa so that my mother could have come to it well-rested, I think she would have loved paragliding, but maybe only with Checo. That night, I felt tired but exhilarated. I kept remembering everything wonderful about the day, and it took a long time to relax into sleep. Loved this post. Very exciting and beautiful. Since I am closer to 75 I may have passed my time for such a stunt???? Nope, I don’t think you’ve passed your time. A decade ago I parasailed over the Yellow Sea off China’s Hainan Island. I was alone in the sky, but there was a “catcher” to assist me with landing. However, when I came off the water for that landing on a sandy beach, the impact on my legs was significant. I vowed I’d never do that again. But flying tandem with a guide that can set you down on your bum without any jolt at all would have been quite a different matter. I wish I’d known.